Burçin Mutlu Pakdil, a 2009 graduate of Bilkent University Department of Physics and a Ph.D. candidate at the Minnesota Institute for Astrophysics, discovered new, ultra-rare galaxy. Pakdil is among the scientists at the University of Minnesota Duluth and the North Carolina Museum of Natural Sciences, and the lead author of a paper on this work. Approximately 359 million light-years from Earth, PGC 1000714, that doesn’t look quite like anything astronomers have observed before. 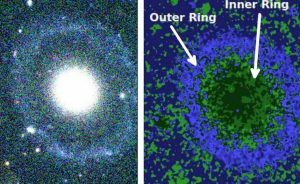 New research provides a first description of a well-defined elliptical-like core surrounded by two circular rings — a galaxy that appears to belong to a class of rarely observed, Hoag-type galaxies. Burcin Mutlu Pakdil et al, A photometric study of the peculiar and potentially double ringed, nonbarred galaxy: PGC 1000714, Monthly Notices of the Royal Astronomical Society (2016).